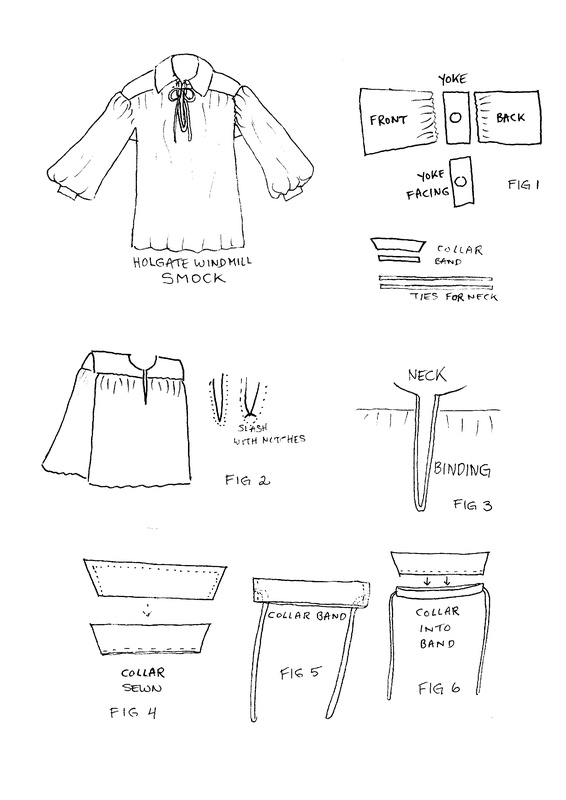 Would you like to make a smock like the one Holgate millers wear? Here it is. The design is basically an 18th century man’s shirt (think Poldark). A 5/8” seam allowance is included in these dimensions. It’s assumed you have experience of sewing. Everything is cut from rectangles. One rectangle for front, 26” wide by 30” long (or your preferred length plus 2” for hem). One rectangle for back, same size. Two rectangles for sleeves, 23” wide and as long as the distance from your shoulder to knuckles. Two x collar band 16 1/4” long by 2 1/4” wide. Two x underarm gusset 5” square. Two x neck ties about 2” wide, length to suit you tied in a bow. Set aside fabric for 1 1/4” wide strips to bind neck edge and sleeve openings. Total length needed about 40”. (You may want to make a paper pattern first.) Cut a piece 18 1/2” long x 9” wide. Mark the centre of the length and the centre of the width. Plot a 5” diameter circle centred on this point then move the circle 1/2” toward either long edge. Draw in the circle. Cut out the hole for a neck opening. Cut two yokes in fabric (yoke and facing). Make a paper pattern first: cut a rectangle 19” long x 4” wide. Fold it in half crosswise and pin together. Piece is now 9 1/2” long. Mark one edge at 7 3/4” from fold. To make a point on the collar, cut a diagonal line across unfolded end, from corner on one side to 7 3/4” mark on the other. Open out pattern piece and cut two in fabric (collar and facing). Attach yoke to front and back. Attach yoke facing to fronts and backs. Snip tiny notches inside staystitching at bottom of slash to make it easier to attach binding. Make the neck ties: fold each strip lengthwise, right sides together. Stitch entire length and across one end, trim seam allowance close to stitching, turn to get a tube. Press. On the body, staystitch around the neck edge just within the seam allowance, then snip a 1/4” notch every inch or so from edge toward staystitching. Attach one side of the collar band to neck edge. 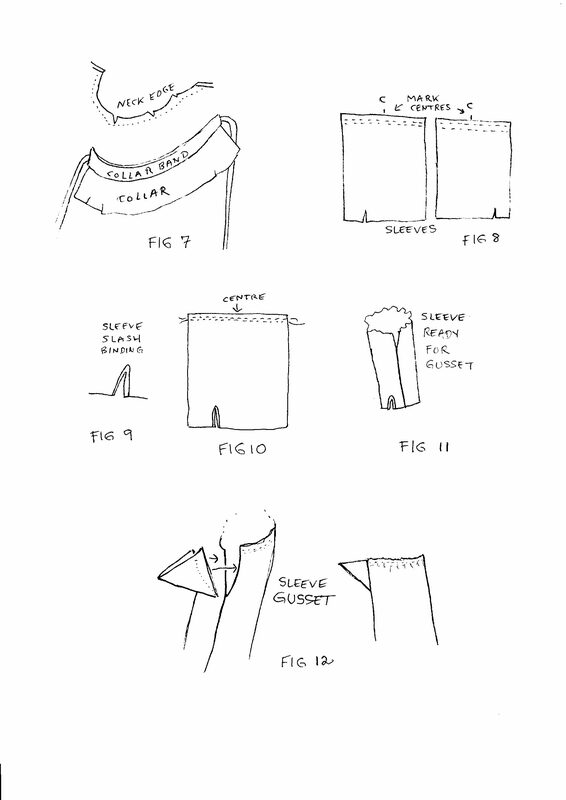 Figure 7 Press the seam allowance into the collar band and trim. Fold in the seam allowance on the other side of the collar band. Sew this side of the collar band to the neck edge either by hand or by top stitching through all the layers. Arrange the gathers on the sleeve evenly. Pin the gathered and gusseted sleeve to the body front and back, matching the marked yoke centre with sleeve top centre. The gathered section of the sleeve should stop at the 9” mark on the body. Stitch the sleeve and its remaining two edges of gusset to the body. 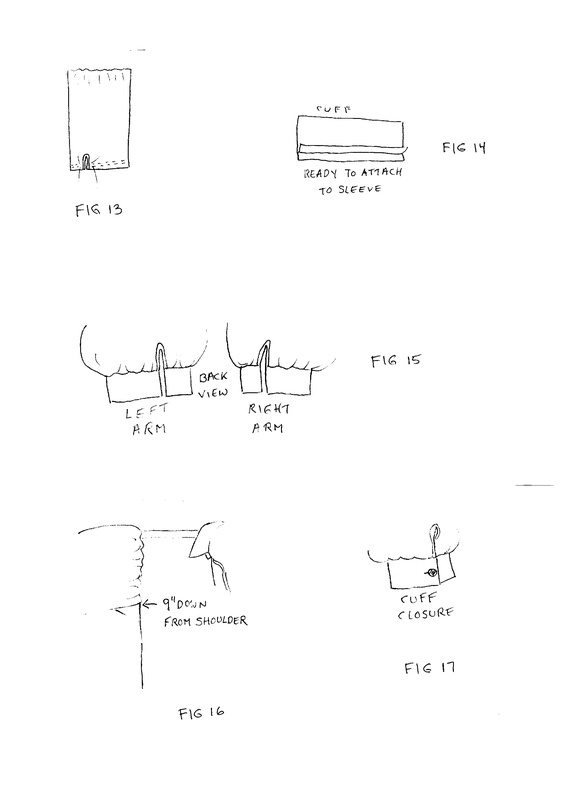 The gusset will form a diamond when sewn in and pressed flat. Stitch the rest of the side seams. Try on the smock and mark the hemline. Test the cuffs for comfort and mark the overlap. Make button and buttonhole in cuff. Figure 17 Overcast all raw edges. Stitch the hem.